If I'm understanding it, three Twins in the Top 32? Or are the 10 at a time a range? If I could make a recommendation to your development team at CTTP... Have a link handy to put all slides on one page to scroll through. I'm curious, but not that curious to click on 15 slide pages. Sorry. White Sox's super-hyped Eloy Jiminez at #4, Kirilloff at #5, Royce Lewis at #9. That would be sweet to see our guys match up this well with Jiminez. Graterol viewed in the same tier with the #1 overall pick last year by Detroit, with Graterol at #33, Mize at #37, although Detroit also has Manning at #28, so you still have to like the pitching depth of both Chicago and Detroit over the Twins. Twins: Kirilloff, Lewis, Graterol (with Larnach, Rooker, Gonsalves, and Badoo further down the list. If this list holds water, there's nor runaway advantage in terms of talent pipelines in the division, but the Twins are certainly in pretty good shape right now in that respect. Yes, Graterol would be #32 in my list. They're ranked. Mobile will do exactly that. Otherwise, it's not feasible for some reason. As I view, the Twins are in the top 5-7 systems in the game right now. 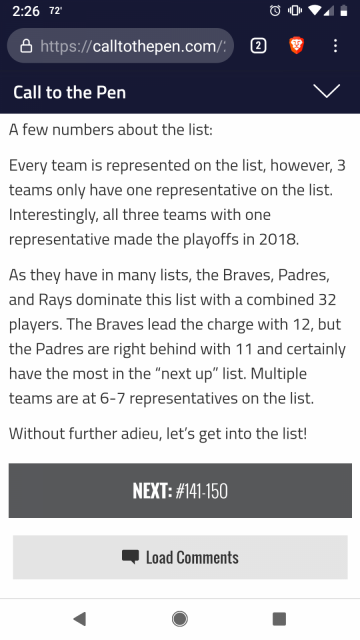 The Padres, Rays, and Braves are the clear top 3, and then there's a glut from 4 through about 12, though, so I can understand a lot of teams in that range. I'm on mobile 99% of the time. I don't see a link to do that. It's not a link, but I did find it's through the FanSided mobile app, not mobile browser. For the record, click-through articles annoy me as well, as I like to scan/speed read and then go back to the parts I want to digest more fully. Not real into back-clicking--I figured someone here would confirm that I was correct in my read-through: Nick Gordon is nowhere on the list. It will be fun to watch how this "volatile" system rounds into shape or not--the volatility reflected by a guy like Baddoo, whom you have higher than the TD guys. There are a bunch of guys in the middle with some real potential to break into the top 150 conversation. The good thing about prospect lists is that the author really can't be wrong and also they are almost never right. No Gordon right now. Some significant concerns there. However, if I were going to 200-250, he'd be in that grouping, but a number of Twins would be, really. I think that's where the Twins system strength is compared with other systems. The next 100 prospects on my list would likely be led by the Padres, which is why they're #1, but then the Twins and Yankees would join teams like the Braves and Rays in the "frequency" grouping. My best explanation to folks is that any list for any author is a snapshot of that moment in time. It's why I don't update my overall list if a new player is added to the league (Yolbert Sanchez, for instance) or one graduates (Luiz Gohara's bereavement time recently was ruled as enough to remove his rookie eligibility, for instance). You completely missed my point . Edited by old nurse, 08 February 2019 - 05:25 PM. No, I got it. I just chose to address that feeling toward lists rather than acknowledge your direct statement is all. Moderator's note: Now that the bickering has begun, let me point out that the site's comment policy is specific about this kind of thing as an example of trolling: "contributing one-line comments* that add nothing but question everything". Your observation could be applied equally vacuously to a multitude of articles or forum posts about prospects, or many other topics. If prospect lists aren't your cup of tea, just skip them. In any case, please don't go further down this tangent, everyone.